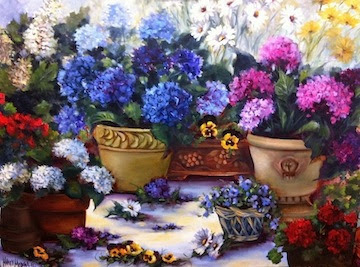 Hydrangea Garden is my newest large work drying in Flower Mound Studio, as the pugs and I have a small celebration over my first artwork sales to Australia. 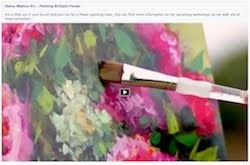 Two of my rose arbor paintings will be shipping to Eaton soon. This is definitely a shipment I'd like to stow away with - how cool to be sending original flowers Down Under! Someday, maybe, I'll be able to visit them. My new hydrangea container garden is destined for Art and Frames by Wood Gallery, along with a few other new container gardens. The flowers have been flying off the shelves there, so I've been busy creating new ones! I think I will have some chocolate or something! Nancy, this is one of your prettiest container garden paintings. Just a lovely combination of colors and textures. Congratulations on all your success. This painting is spectacularly BEAUTIFUL. How do you stay awake so late, Nancy? (Assuming the time stamp is correct on my blog, this says you posted just before 11 pm last night! You have enough energy to make 5 of me! Another beautiful painting with my second favorite flowers, the hydrangea. Also, I love the soft daisies in the distance. Nancy - so fun to talk art and see your Flower Mound Studio and beautiful paintings in person yesterday - hopefully I can return the southern hospitality in Colorado some day soon. 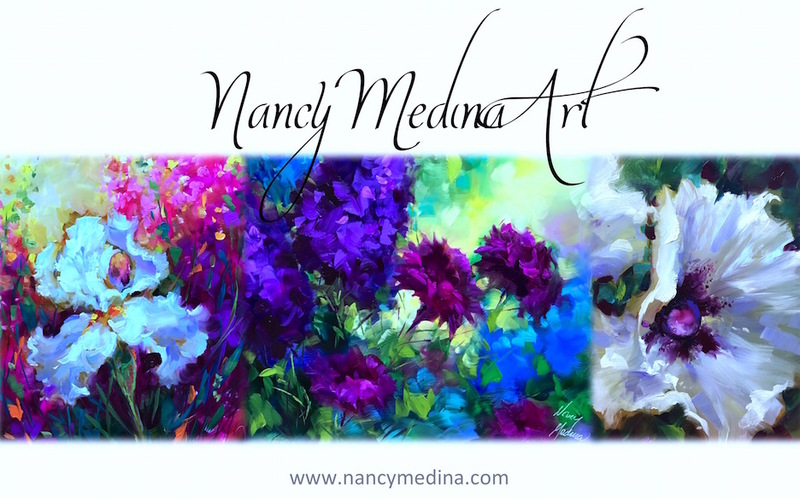 This is a stunning painting Nancy...some of my very favorite flowers too...I love Hydrangeas. Beautiful and inspiring work, as always. 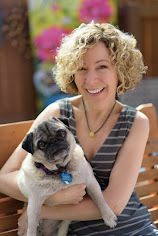 Thank you so much Jo, every one seems to be different than the last. Sherry I owe it all to caffeine! : ) I think your stamp might be on Eastern time, I posted this about 9:30 pm CT.
Martha it was wonderful to see you again, I am thinking about you and your mom and your family. I hope someday to be able to see your beautiful watercolors in Colorado! Ruth I love them too, they are such romantic flowers. I hope my hdyrangeas blooms this summer. Can't wait to see what you create next lady! Love Love Love it! Blue Hydrangeas are so vibrant! And you definitely captured that!